The latest exhibition at The Farjam Foundation, titled “Memories of Destruction: Selected Works by Aydin Aghdashloo”, is a tribute to one of Iran’s most acclaimed modern masters. Aydin Aghdashloo is an artist, author, illustrator, teacher, art critic, historian and consultant, and he has been at the forefront of the artistic and cultural renaissance that began in Iran in the mid-20th century. The artworks featured in the show are from the 73-year-old artist’s most well-known series, “Memories of Destruction”. The series, begun in the 1970s, spans the period before and after the Islamic revolution in Iran and addresses issues of lost heritage and identity, while also reflecting on the cycle of life and death. It looks at the inevitable destruction caused by the transformation of the human condition, from a cultural, historical and existential perspective. The paintings in this series are inspired by classical European and Persian art. But the artist has wilfully destroyed his amazingly detailed copies of the old masters by deconstructing the objects and mutilating his canvases by tearing, burning and scratching them. “‘Memories of Destruction’ began in the 1970s when I learnt to view the world in its full historicity. My paintings refer to a beautiful past laced with sadness because I realised that the past is forever linked with our future and all beings will inevitably cease to exist,” Aghdashloo says. “So, destruction and its historical memories have formed the bedrock of my work over the past 40 years. My themes are universal. They include magnificent objects and paintings from the past, young faces glowing in the belief that glorious times are eternal, and wrinkled, broken visages that remind us of the unavoidable future,” he adds. The show has been divided into two categories — “Orientals” and “Occidentals” — based on the source of inspiration behind the paintings. The “Orientals” feature copies of works by old Persian masters such as Reza Abbasi, the court painter of the early Safavid dynasty. Here, Aghdashloo has copied ancient Persian ceramics and miniature paintings. But the delicate bowls and vases are broken into pieces and placed on a background of raging sandstorms or cold winter landscapes. And the beautiful miniatures are depicted as crumpled, torn or burnt to comment on the sociopolitical situation in his country, and to express the anger and frustration of seeing one’s heritage being damaged and traditional values being annihilated. “I spent my youth collecting antique artworks and enjoyed restoring the damaged calligraphic pieces, miniatures and handwritten manuscripts to their original beauty,” Aghdashloo says. “Through these artworks I felt deeply connected to the soul of Persian culture, which has been bruised and hurt throughout history, but remains ever so glorious and regal. “But restoring these works and witnessing their rebirth invoked a reverse process in my paintings. The masterpieces that I had resurrected were once again destroyed in my paintings. The flowers and birds in the decorations on lacquer boxes and mirrors cases fell to the ground as the leaves and branches on which they roosted vanished. “Elegant calligraphies were torn apart and burnt with the pieces tossed into a dark sky, twisting wildly as they descended towards sharp wooden pieces, or shown lying beside worthless pieces of rock. 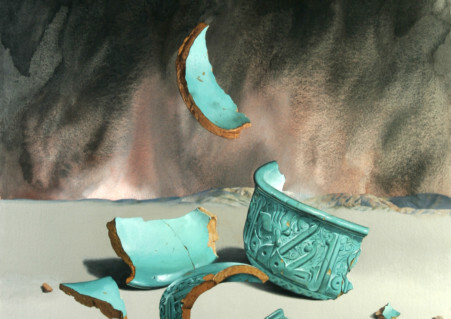 And the exquisite bowls, embellished with Kufic inscriptions and turquoise glazing, were shattered into fragments, blown away by desert storms. These images depicting the negligence and contempt of the greatest achievements of Persian culture reflect the historical injustice I have witnessed and continue to see,” the artist says. The “Occidentals” in this series are based on works by Renaissance masters such as Sandro Botticelli. But the copies of famous portraits by them have been disfigured by scratches on the canvas or rendered faceless by covering the faces with bandages or paint. “These paintings symbolise the cycle of life itself — birth, beauty, youth and joyfulness, turning to maturity, ageing and the harrowing moment of death,” Aghdashloo says. “This vision commenced with paintings by the masters of the Renaissance. “The first work in this series was a recreation of a portrait by Botticelli, in which I removed the face and placed a landscape in its place. Then the process of conversion and destruction began. I reconstructed masterpieces from art history with every detail, decay and varnish crack, and then destroyed them violently. This technique developed into a metaphor for the natural life cycle and process of ageing. “The destructions happen by changing and transforming the painting itself, or by actually tearing it, scratching it with a knife, or burning parts of the piece. The extent of the damage depends on my inner emotions at the time; and in moments of dark, bitter crises, I have almost annihilated some paintings,” Aghdashloo says. Despite the depiction of death and destruction, the artist’s message is one of hope for the birth of a better future. It is difficult for him to demolish his own work, and he feels that burying a knife into his paintings is like stabbing himself. But he believes it is necessary to do this so that a new and better world can be born. “I want to visualise the future with hopes of a world where justice, truth, equality and compassion are absolute and vital,” he says. “Memories of Destruction: Selected Works by Aydin Aghdashloo” will run at The Farjam Foundation until December 23.